All Android phones have inbuilt call block feature. Call block or call filter feature provides us facility to block unwanted callers and SMS on the Android phone. The procedures are different according to Android phone brand like Samsung, LG, HTC, Micromax etc. 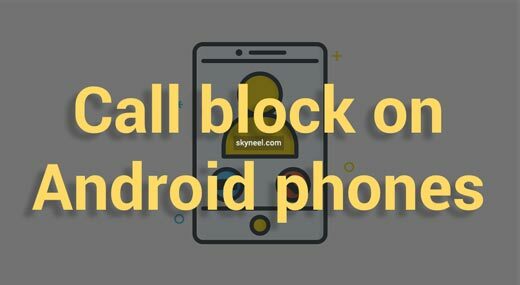 I am trying to explain the method of how to block call in the popular Android phone. Open the menu >>> Go to the Phone app >>> Select Blocked Contacts option >>> Tap on the Add button to add any contact which you want to block. Note: Either you can add a contact from the people app or manually enter a number to block. Go to Settings >>> Call >>> Call Reject. Note: If you want to block calls from the contact list then you can create your own rejection list. 1. Open contact >>> Tap on the Menu button >>> Tap on Add to Reject List. 2. Open the Phone app >>> Tap on Call Settings >>> Tap on Call Rejection >>> Tap on Auto Reject List option to open the list. If you want to block only some of the contact’s numbers, you can remove blocking from the valid phone numbers from the Auto Reject List menu in the Phone app. Open contact app >>> Tap on menu button >>> Tick on checkbox for block incoming calls direct. I hope you like this call block in Android guide from which you will be able to easily call block in Android top brand Smartphones without any extra efforts. If feel any problem in this guide then please use comment box. Thanks to all. Thanks for your thought. It’s helped me a lot. Hey man we know you are trying to help but just tell me how to block text messages on micromax A096. Use calls Blocker app from Google play store, I am using ESET Nod32 Antivirus for block unwanted call and SMS. This is a good Antivirus with lots of extra features. Micromax canvas-tell me unknown number block . what is Step .